It’s no secret that celebrities have a bit of a thing for finding the most obscure names for their offspring. It seems as though every well known celebrity is having a baby nowadays, with each one trying to outdo the other on how ridiculous their names are. 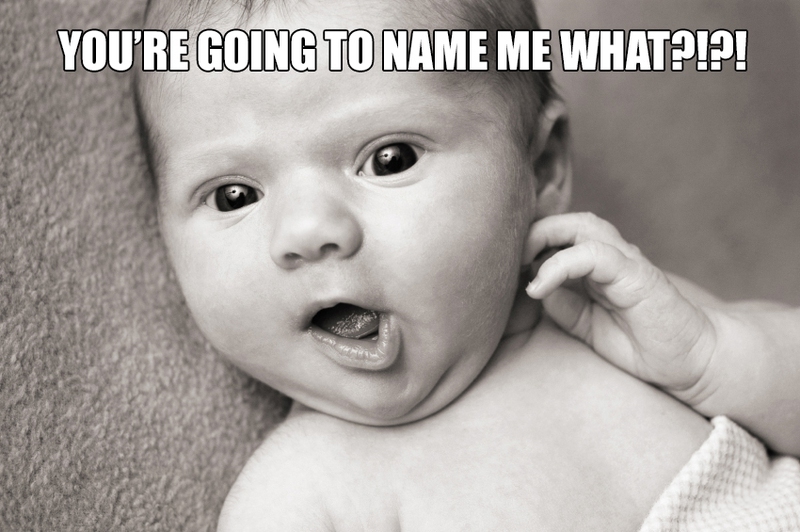 We’ve found just a few of the most ridiculous celebrity baby names for you to have a giggle. Let’s kick this list off with one of the newest additions to ridiculous baby names; North West. The daughter of Kim Kardashian and Kanye West was born in July, 2013, before being named five days after. We always knew that Kim and Kanye wanted to stay with the K theme that the Kardashians themselves coined, so were surprised when we found out their daughter was named North. Many people expected her name to be Kaidence, in honor of Kanye’s late mother, but that didn’t happen either. Instead, North West (or Nori) for short, was bought into this world. This spoiled princess already has her own tailor so she can keep up in the fashion stakes with her Mom. She’s always in the newspaper too, just like both her parents. We wonder what this little angel will grow up to be? A celebrity perhaps? Either way, she’ll always be in the limelight. Here’s another fairly recent addition to the ridiculous celebrity baby name list, as the daughter of Beyonce and Jay Z. At just 2 years old she is already one of the most famous children on the planet, constantly making the headlines due to what she’s wearing or where she’s been. This Halloween she was featured in many magazines for her Michael Jackson costume, complete with pink microphone. However, it is thought that Beyonce and Jay Z are trying to do the best they can in order for Blue Ivy to live as “normal” of a life as possible. A pretty mean feat when you’re worth a whopping $2 billion as a couple. There have been plenty of pictures of fun family days out, including a day at the Louvre (albeit a private viewing). It seems as though Blue Ivy is a happy child who gets to spend plenty of time with her parents, even if they are always touring. These names are just going to keep getting weirder and weirder, but we don’t think anyone comes close to Moxie Crimefighter Jillette. The daughter of magician Penn, best known for his for his work as a duo in Penn & Teller, has one of the most unusual names we’ve ever heard. When asked about it, however, Penn Jillette has a pretty awesome answer. He said that only losers named Dave think having an unusual name is a bad thing. He goes on to say who cares what they think, as they’re called Dave. Pretty hilarious if you ask us. However, Moxie Crimefighter Jillette is definitely a far cry from the name Dave. The name Moxie was actually an American name for the first international soft drink, before going on to mean chutzpah (cheeky). We wonder if little Moxie is a bit of a cheeky madam and if she’s also a member of the magic circle?! Ever fancied naming your child after an inanimate object? Well, you’ve probably cottoned onto this trend thanks to Gwyneth Paltrow and Chris Martin who named their first daughter Apple, in 2004. When asked why she chose such a name during an interview on Oprah, she explained that apples are so sweet and wholesome and biblical. Um, we don’t mean to disappoint you Gwynnie, but Eve was tempted by an apple in the bible… We think Gywneth may want to brush up on her religious texts, after saying her son was named Moses after the song Chris Martin wrote her before he was born. Not anything to do with the bible then, no? Alas, they’re both pretty adorable kids and so we’ll let them off. Unfortunately, the pair have recently split up which has hit the headlines all over the world. Let’s hope they keep it friendly for the kids. Yes, you are reading this correctly. Kal-El is the original name of superman, and yes Nic Cage does have a son with this name. Upon meeting his third wife, Alice Kim, they had a son together which they decided to give this rather…interesting name. Apparently, Nicolas Cage was once considered for the role of Superman in a movie Tim Burton was directing, so maybe that had something to do with it? What makes this name even funnier is that it actually has a place in the official name dictionary, with a meaning that states; the Kyrptonian birth name of Clark Kent. It has also appeared in the Top 1000 Baby Names List, in America. We can’t stop shaking our heads. Please people, stop calling your children Kal-El! It is thought, however, that the Kryptonian meaning of the word is star child. So there we go, child of a star (kind of works). Actually, you’re going to get more than you bargained for with our number 8 as we have 4 siblings all with some rather ridiculous names. The children of TV star chef, Jamie Oliver, and his wife Juliette Norton, all have silly names. We think Buddy Bear Maurice certainly takes the crown for the most obscure, but the others are called Petal Blossom Rainbow, Daisy Boo Pamela, and Poppy Honey Rosie. We have no idea what this couple are thinking every time they have a child, but they certainly are creative. Hopefully, they’ll all go to the same school and won’t get picked on so much for having bizarre names. At least they all get to grow up together having rather unusual names; can you imagine what they’ll call their own children? Probably Dave, Elizabeth and Mary. Hats off to the family though, as they seem like the happiest celeb family we have ever seen. Here’s another family who are bordering on child cruelty when it comes to naming their children. Forest Whitaker and his wife, Keisha Nash, have been married since 1996 and have two children together. They have another two (one each) from previous relationships as well. Keisha has Autumn, a daughter from her previous relationship and Forest has Ocean, a son. The pair have had two daughters together, called Sonnet and True. Mind you, when you have a name like Forest you’re probably unlikely to go for something usual. When asked about True and Ocean, he said that he wanted their names to reflect their destiny. He wanted his daughter to be honest and his son to be expansive, just like he tries to be a forest; constantly growing. Um, okay then Mr Whitaker, whatever you say. What on earth does he want to Sonnet to be like then? 14 lines of poetry? It’s no secret that the Jackson family have always been a little quirky, so it doesn’t really surprise us to know that Jermaine Jackson has called his son Jermajesty Jackson. Jermaine Jackson has 9 children altogether; we can’t help but wonder if he’s trying to start his own band… There are some usual names in there (such as Jermaine Jr) and some rather unusual, such as Jaafar. Most of them begin with J, although there is Dawn, Autumn and Donte, too. We wonder if they feel left out? Prize for the best middle name in the Jackson family definitely has to go to Jeremy Maldonado… We don’t even know what that means. Jermajesty is definitely the most ridiculous, however. It seems as though he wanted to give his son a majestic name, beginning with J, and so ended. Words fail us when it comes to the son of Jason Lee and Beth Riesgraf, who chose to name him Pilot Inspektor. Jason Lee, who played the lead character in My Name is Earl, told magazines that he chose the name after hearing a song by the band Grandaddy (don’t worry, we’ve never heard of them either). The opening track of the 2000 album titled, “He’s simple, he’s dumb, he’s the pilot”, blew Jason’s mind when he first heard it, which is why they then decided to call their son Pilot. Okay, so that explains the first name but where on earth does Inspektor come from? And does he know it’s spelled wrong? Either way, Pilot Inspektor is one adorable child now, so it can’t have done him any harm. Unfortunately, his parents aren’t together anymore but he still sees both of them on a regular basis, which we think is great! When you think of the name Bronx, what automatically springs to mind? If it’s something ghetto then you’re barking up the wrong with this next child. Ashlee Simpson and Pete Wentz gave birth to a little boy in 2008 and opted for the name Bronx Mowgli Wentz. We assume Mowgli was because of their undying love for the film, The Jungle Book… When asked about Bronx, however, Pete said that the name goes back to a very specific story between him and his wife. He’s adamant that he wasn’t trying to give their son street cred. Either way, the pair broke up in 2011 and Ashlee applied for primary physical custody of their son. She says that the couple married too young, even though Pete Wentz was apparently against the divorce. Pete recently had another child with his second wife, Meagan Camper, named Saint Laszlo. Good luck to them both!